One of the biggest mistakes we make as golfers is to over estimate how far a ball will travel from a marginal lie. We just think if we swing harder, surely the ball will travel farther!! 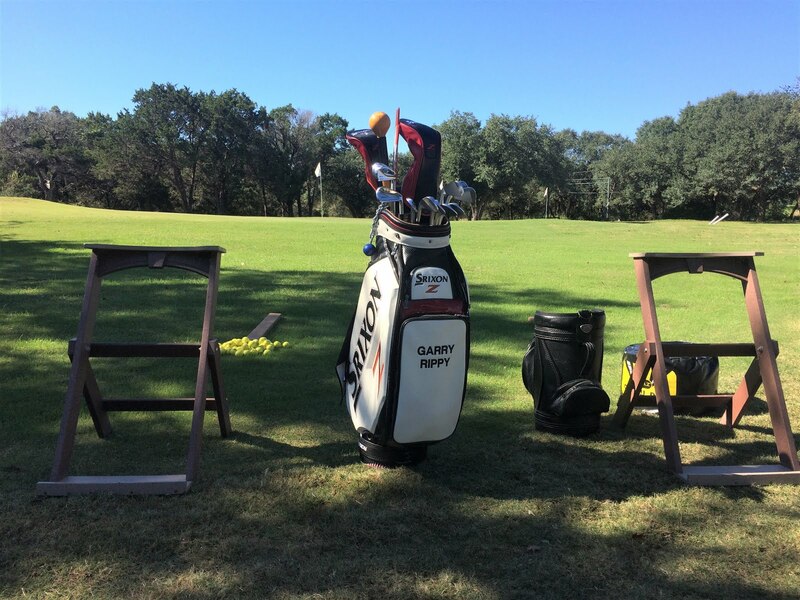 The fact is, for the lie pictured below, you should swing harder, but you better be using a lofted iron as well. How many times have you had a similar lie and tried to use a hybrid to no avail? In this post I will explain how to read your lie for correct club selection and discuss some course management so you can turn those double bogies and worse into lower scores. Obviously this is a terrible lie. The ball is sitting down in the rough and the chances of catching a lot of grass between the golf ball and your club is significant. When you get this much grass between your club and ball, the ball will tend to fly lower with very little spin. In this instance you need a club which will cut through the grass. In terms of just getting the ball to get in the air with some distance, I would recommend a lofted iron. I would say something with more loft than a 7 iron would be the club of choice. With this lie there is just too much ball below the grass to be effective with a hybrid and for sure do not hit a fairway wood. 1. How far is it to the green? 2. If you cannot get to the green, how far do you need to hit it? 3. If you are trying to carry a water hazard or bunker, how far is it? 4. Where is the best place to play your next shot from? Keep in mind, this ball will come out very low so it will not have the same carry yardage as a normal lie. As an example, for this lie, I would guess you could lose as much as 20-30 yards of carry distance. And, when it lands on the green, it will have very little spin so it will roll quite a distance. Now that you have the idea of the distance you are trying to hit it, you have to execute with the correct technique. 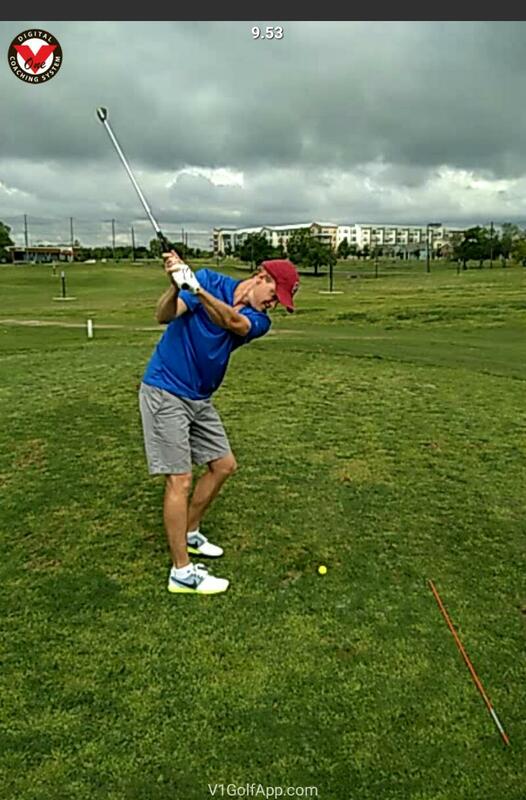 In this circumstance, I suggest playing the ball either in the middle of your stance or if the lie is deeper than this, then move it back about an inch or so in your stance. You should feel like you swing the club a little steeper on the backswing to help you dig the ball out. With a steeper swing, you will catch a little less grass between the club and the ball. It is OK to grip a little firmer on the club and swing a bit harder so that you can get the club through the ball without losing control. This lie is not quite as deep as Lie A. In this case you definitely have a choice of either hitting an iron or a hybrid. This is due to the fact that at least half the ball is above the grass. So if you need a little extra distance, a hybrid will work just fine. You might even consider using a lofted fairway wood such as a 5 wood. The only issue with this lie is you may still catch a little grass between your club and ball which can cause a "flyer". A flyer is a shot hit very solid but with very little spin so it really takes off. Flyers may travel 20-30 yards farther than a normal shot. I would again ask yourself the same questions as in Lie A before finalizing club selection. Always leave yourself the best place to play your next shot from. As far as technique, this lie does not require you to change much. The general rule is as the lie gets deeper, move the golf ball position to center or slightly behind center of stance. This is the best of the three lies pictured. With this particular lie you can hit an iron, hybrid or fairway wood. If there is more than half the ball above the top of the club face, and you need the distance, go ahead and hit a fairway wood. If the lie is really good, then a 3 wood should be ok, if the ball is sitting down just a little, then a 5 wood might be more appropriate. Before hitting any of these shots, even the good lie, always decide how far you need to hit it and where is the best place to play your next shot from (broken record). Well now you have done it! A great tee shot comes to rest right in the middle of a divot...don't panic. As with the other grassy lies, you have to take a look at the lie and figure what exactly you can do with this ball. If the ball is sitting down in the divot then you will need to take a lofted iron and dig it out. It's the same technique as with the ball being buried in the rough. Move the ball position to at least the center or may an inch or so behind the center of your stance. I suggest gripping down a little on the grip and swinging a little steeper on the backswing. The goal is to try and strike the ball before the ground. This ball will come out lower than expected and carry shorter than normal. If the lie is in a divot which is filled with sand then you really have to hit the ball first just as you would in a fairway bunker. Sometimes golf is just not fair. Here we have two golf balls only inches apart yet two different lies. One ball is sitting down on a firm, bare lie and the other is sitting almost perfect. The bottom line with lies is don't panic and play the shot which you know you can play with success at least 7 out of 10 times. Remember loft is your friend. The successful shot is not necessarily the shot that goes the farthest. Play to the place which leaves you with the easiest next shot. Golf Swing Drills/Training Aids do Work! I would like to show how a little dedicated practice utilizing the correct drills can improve your golf swing. This is my student Stephen J. and he had an issue with getting the golf club too much behind him and a little flat at the top of the swing. This position was causing very inconsistent golf shots. In the picture on the left below, this is how it would look if the hands are too much behind you. I like the hands to be higher and more in alignment with the right shoulder as shown in the picture on the right. The red line indicates an extension of the golf club and it is pointing way outside the target line. This is called a very "flat" position. The yellow line indicates the ideal position of the golf club at this point. The yellow line will be very similar to the shaft position at set up. If the club was positioned more on the yellow line it would feel very upright to the golfer, but would be on plane. 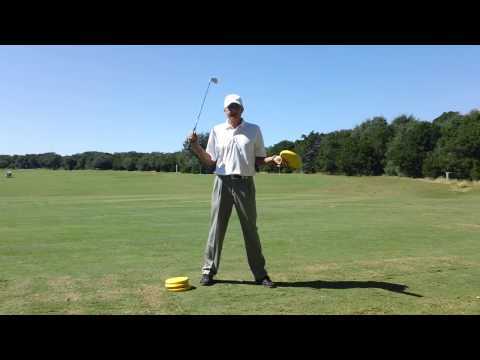 In the video below, I utilized a training aid from Eyeline Golf called the Speed Trap. The Speed Trap is a durable plastic board and comes with foam extensions. They help direct the golfer to swing the golf club between the extensions. There are many ways to place the extensions to correct various path or plane issues. They simply attach with Velcro so if the golfer strikes them, they go flying. If the golfer is swinging too much from the inside on the downswing, then the extensions are placed as pictured. I also placed an alignment rod next to the rear extension. Note the angle of the rod matches the angle of the shaft of the golf club. This drill really helped Stephen get the club more "up" and on plane in the backswing. It also helped him not drop the club so much to the inside on the downswing or he would strike the alignment rod. After working on the drill with a short iron for 15-20 minutes Stephen was able to get the correct feel for the backswing. He began to get the club on the correct plane and started hitting the ball much higher and straighter. We also performed a few other drills from my Swing Drill Library which helped him as well. In fact, we performed the 1-2-3-4 Drill which I demonstrated in the post below. I have to be prepared to have many ways to explain and demonstrate correct golf swing positions and feels. Something which works for one golfer may not work for the next. This was Stephen's second lesson and with more focused practice he will begin to break his old habits.